A clock is no real indicator of when to go to work. A calendar helps only a little. But when you feel the icy chill of winter letting go, tempting you to ditch the heavy winter parka in the afternoon sun, yet leaving you still bundled up with cozy blankets in the night, he knows it’s time. It’s time for Jason Haverkort to head to the sugar woods and turn the taps on. When nights are still cold, water from the soil is absorbed into the maple tree and during the day, warmer temperatures create pressure which pushes the water back down to the bottom of the tree. The result? Clear sap, which is lightly sweet and has the consistency of spring water. It’s ready to be turned into syrup. “Only mature maple trees are tapped,” explains Jason. “Meaning the tree must be 30 to 40 years of age.” Once at a mature age, the trees may produce sap for 100 years or more. “Each season, the trees are tapped in a slightly different spot than the previous year,” he adds. This preserves the health of the tree and enforces sustainable growth. 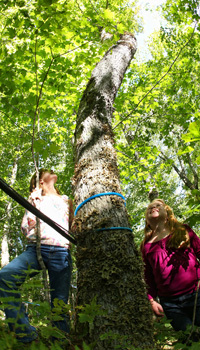 Tapping does not affect the growth of the trees. 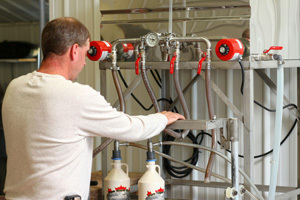 At Haveracres Maple Farm, a vacuum tubing system is used to collect the sap, as opposed to the traditional bucket system. 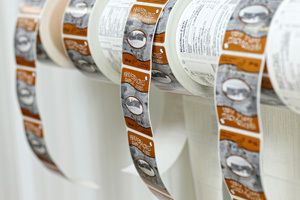 This greatly reduces the labour, plus creates a more sanitary environment for the collection process. Over 35 miles of blue tubing connects the thousands of taps, spread-out over Jason’s 125-acre operation (he has another 125 acres with silviculture work being done). 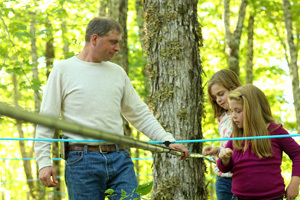 The blue tubing feeds into nearly six miles of black mainline tubing, which is on an incline, allowing the sap to run downhill, into the camp. The use of reverse osmosis concentrates the sap’s sugar three or four times, by separating water from the sugar molecules at high pressure. This removes up to 70 per cent of the water from the sap prior to entering the evaporator and saves on time by speeding up the concentrating process. Once the sap has been through this process, Jason boils it down, resulting in the maple flavor we crave for our pancakes. It takes about 40 liters of sap to make just one liter of maple syrup. During this process, the excess water is removed from the sap and nothing is added. The sap (two percent sugar when it leaves the tree) is fed by pipes from the storage tank to the evaporator. As it boils, the water evaporates and the sap becomes denser and sweeter. It is boiled until it reaches 66 percent sugar. 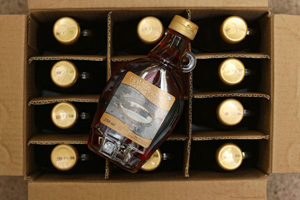 This now maple syrup is ready to be packaged. While Jason does a lot of packaging at the end of each season, he puts some of his 1000 - 1500 gallons of syrup in stainless steel drums. Throughout the year, when product is running low, Jason will take the syrup from the drums and replenish his stash of jugs and bottles. 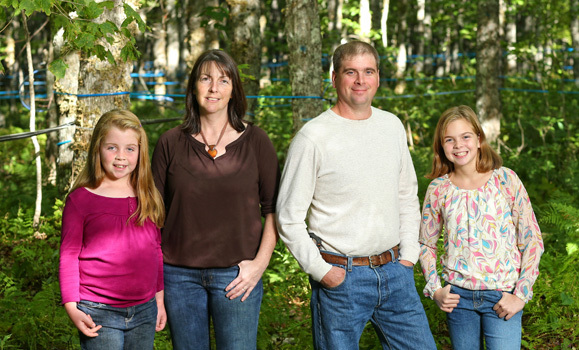 A maple syrup producer since 1999, Jason and his family produce high quality syrup available in a variety of sizes from 100 ml to four liters. They also produce maple butter. Haveracres Maple products are sold in Sobeys locations from Port Hawkesbury to Truro, various Farmers Markets and local stores. Nicole, who also works outside the home, helps Jason when she can during sap season, “I come down to keep him company,” she laughs. Their two daughters, Jessica (nine) and Juliana (12) often accompany him on Saturday mornings to the Farmers Market. “They also like to help with the bottling,” adds Nicole. Extended family also step-in to help when necessary. “Jason’s uncle is here almost every night when we’re boiling,” says Nicole, adding his parents also help a lot. Of course, Jason doesn’t sit around the other 46-48 weeks of the year, twiddling his thumbs until the weather turns. There’s ample work to be done on the sugar farm year-round. Tap lines are constantly examined and mended when necessary. And just after each season, the lines are thoroughly cleaned. 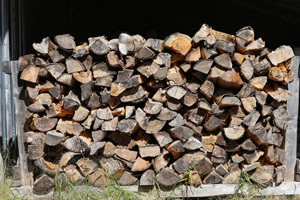 There’s also the 10-12 cord of wood needed to keep the sap boiling on the wood fired evaporator inside the camp. During the summer months, Jason grows pumpkins to also sell at the Farmers Market in the fall.